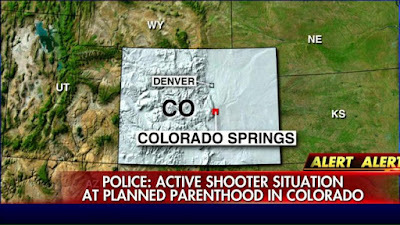 The breaking news today, happening in Colorado Springs, was predicted. I forecast this on Wednesday, noting this was possible on Black Friday. I think the "copycat" calendar cannot be ignored. The Paris Terror Attacks occurred on Friday the 13th, exactly two weeks ago from Black Friday, November 27th. The copycat effect has an internal clock that often works on two week, one month, and one year anniversary cycles. Therefore, while organized terrorists might not do anything on this coming Friday, it actually is the lone player, triggered or inspired by the Paris events, who would. 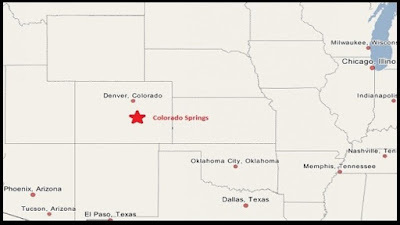 On November 27, 2015 - this year's Black Friday - at 11:38 a.m. (Mountain Time; 1:38 pm Eastern), the first “shots fired” call came in to the police of Colorado Spring, Colorado. 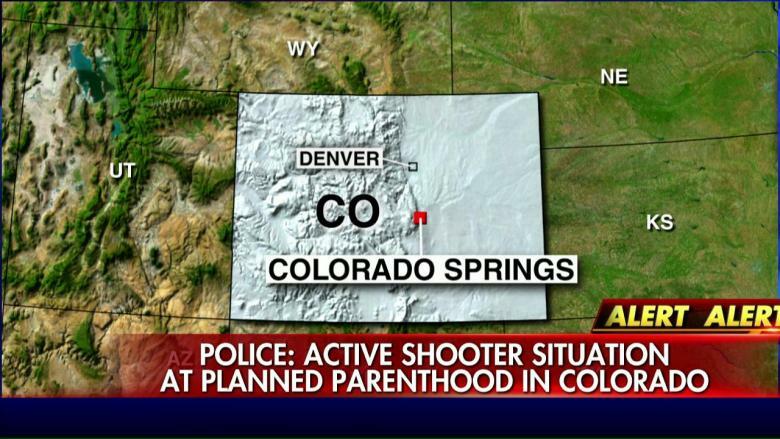 An active shooter was reported at the Planned Parenthood building, 3480 Centennial Boulevard. Colorado Springs police, El Paso County Sheriff's Office and Colorado State Patrol officers responded to the scene. At 2:17 p.m., Colorado Springs police tweeted that "officers are encountering gunfire" and the scene is still an active shooting. 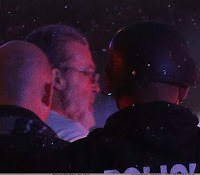 The gunman engaged with police officers, exchanging gunfire, injuring five law enforcement personnel. Nine individuals have been taken to local hospitals; six to Penrose and three to Memorial. A dispatcher said one patient was wounded at Elite Vision, located an adjacent building at 3470 Centennial Blvd. The area is near a shooting center, a bank, a grocery store, and other businesses. Colorado Springs Police report that Centennial Boulevard is closed in both directions between Garden of the Gods Road and Fillmore Street. Police closed Centennial Boulevard in both directions and customers were locked down at a King Soopers grocery store and several nearby shops at Fillmore Street and Centennial Boulevard. The city, in the central part of the Colorado, has more than 400,000 residents. "Colorado Springs is situated near the base of one of the most famous American mountains, Pikes Peak.” ~ Wikipedia. Readers of this blog already know that Pikes Peak is very special. See here, from 2011. At 4:00 pm Mountain, police reported the shooter was still active, and that all roads around the scene continue to be closed. One report said the suspect had a “high-powered rifle.” Police said the suspect may have also brought "devices," including propane tanks, to the clinic. One victim has been identified. His name is Garrett Swasey, 44, a member of the University of Colorado at Colorado Springs Police Department, Colorado, for six years. He is married to Rachel, and the father of two small children. Swasey was killed when he responded to help other officers under fire. Swasey was a junior national couples ice dancing champion in 1992. Swasey won the junior national championship in Orlando, Florida., in 1992, with partner Christine Fowler of Baltimore. Fowler and Swasey, in third after the compulsory phase of the competition, took the title by winning the original and free dance programs, according to a Baltimore Sun article. Three years later, Swasey and ice dancing partner Hillary Tompkins competed in the 1995 U.S. Figure Skating Championships in Providence, Rhode Island. The Denver-based ice dancing couple placed 13th at the championships and later performed on Musical on Ice shows at the Forum in Presque Isle, Maine, according to the Denver Post. Swasey was also a volunteer in his community, the co-pastor at Hope Chapel in Colorado Springs for seven years. 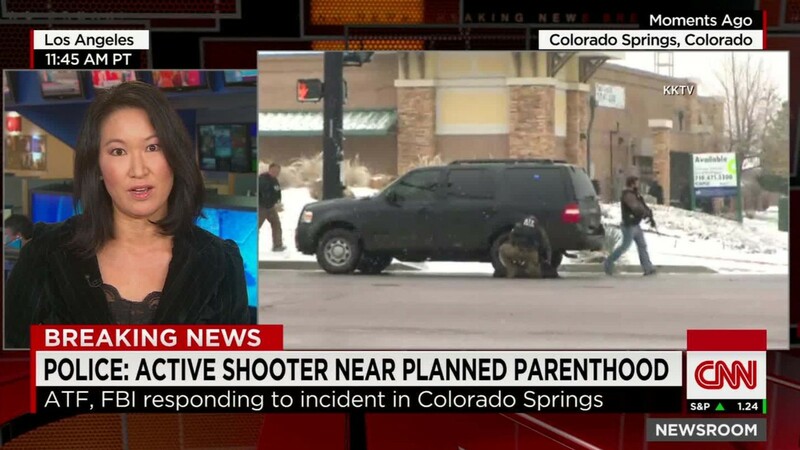 Two others, civilians, were confronted and killed, one apparently at the entrance to the Planned Parenthood building. They have not been identified yet. In initial reports, the suspect was described as a white man in his 40s wearing a long coat and a hunting hat. 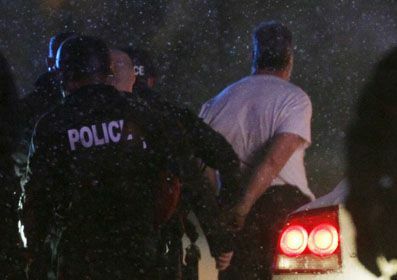 The suspect surrendered to police at about 5:00 pm, Mountain Time. Overnight, the gunman was identified as Robert Lewis Dear. 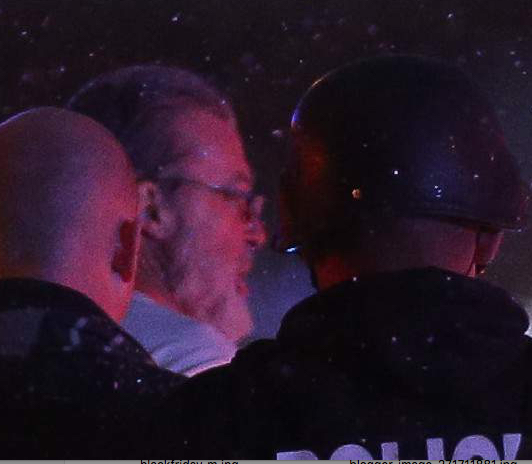 He is shown above, a bearded Caucasian male, being taken into custody on November 27, 2015, outside the Planned Parenthood Clinic in Colorado Springs, Colorado. Reportedly, Dear lives in is from Hartsel, Colorado. Hartsel is officially seven miles east of South Park. South Park (1997 - Present) is an American adult animated sitcom created by Trey Parker and Matt Stone for the Comedy Central television network, situated in and around the same named Colorado town. The real South Park existed before the television series. Dear’s age has been reported to as both 57 and 59, but public records indicate that he is 57. His family is from South Carolina. According to court records, Dear has an arrest record in both North and South Carolina. He has been convicted of several traffic offenses, but has been arrested several times on more serious charges. His convictions include seat belt violations, driver’s license violations, operating a vehicle in an unsafe mechanical condition and driving a non-registered vehicle. Dear was charged in Colleton, South Carolina, with two counts of cruelty to animals in 2002, but was found not guilty in a bench trial. He was also charged in 2002 in Colleton with charges of “peeping Tom” and eavesdropping. Those charges were dismissed. Source. The name Robert is a Germanic given name, from Old High German Hrodebert "bright with glory" (a compound of hruod "fame, glory" and berht "bright"). The name Lewis imports meaning in Freemasonry to designate the son of a Mason. Within Freemasonry, Lewis is a significant name. The Normans brought the name to England, where it was usually spelled Lewis, though the spelling is sometimes Louis in America. Lewis is routinely said to mean "renowned warrior." In Freemasonry, the origins developed from the use of the "lewis," a device to lift stones to their required height and set them in place precisely. Source. Dear is an early English surname. It has two possible origins. The first is from the pre-7th Century word deora, meaning beloved and used as a byname, whilst the second is from the word deor, used to describe a wild, swift animal, specifically a deer. In that case the name may have been a nickname for a fast runner, one who had some of the characteristics of a deer. The modern surname can be found as Dear, Deare, Deares, Deer, Deere and Deerr, with diminutives Dearan, Dearing, Deering, Doring, and others. Source. All morbidity aside, you called this one! Working with name associations, I find: dear = deer and, from Hartsel, hart. Hart is the name of a young male red deer. The Asian steppe people had a belief that the deer was a conductor of souls to the underworld/afterlife. I think, more precisely, 'Robert' was meant to mean 'like the shining one's'. Colorado Springs had a shooting on Halloween which left 3 people dead. 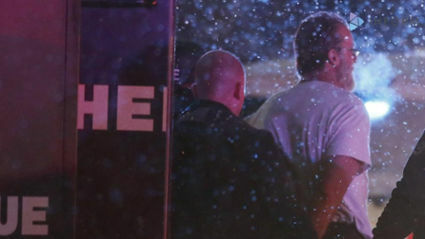 The shooter was killed by police in the Wendy's parking lot on Wasatch. This took place 2 Blocks from Pike's Peak Ave and 3 blocks from Colorado Ave.
1 1/2 mile away on Colorado Ave. hundreds of kids went trick or treating at businesses in Old Downtown just and hour and a half later.